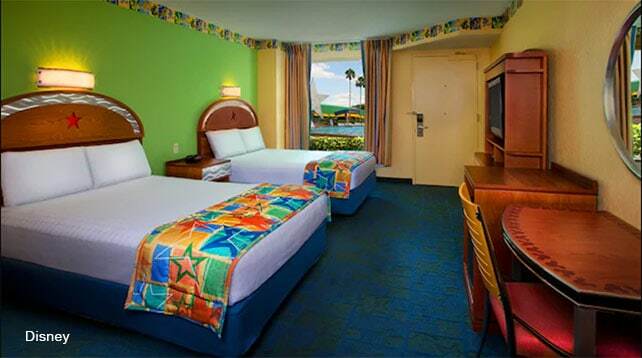 When it comes to value resorts, Disney’s All Star Sports is a fun option to consider. If you want to know more about the factors that continue to draw guests back to All Star Sports resort, join us on this countdown to see all that this fantastic resort has to offer. True, value resort rooms are not nearly as spacious or luxurious as deluxe resorts on the property. However, guests are delighted at the value for the price. Comfortable beds, in room thermostat control, and Mousekeeping (housekeeping) services are hotel room factors that make the resort rooms a good fit for families. Because value resorts tend to be more sprawling, two pools are available in different sectors of the resort. 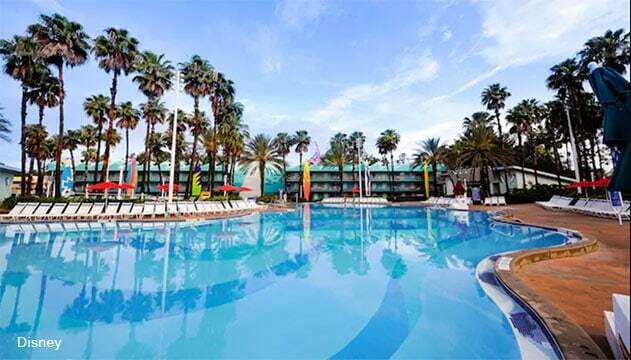 At All Star Sports, guests enjoy the Grand Slam pool and the Surf Board Bay pool. Guest are welcome to visit either pool as they wish. The shallow water, small kiddie pool near the surf pool and nearby cabana makes All Star Sports pools a fun vacation hangout. Check out this video from TouringPlans about Disney's All Stars Resorts including All Stars Sports! 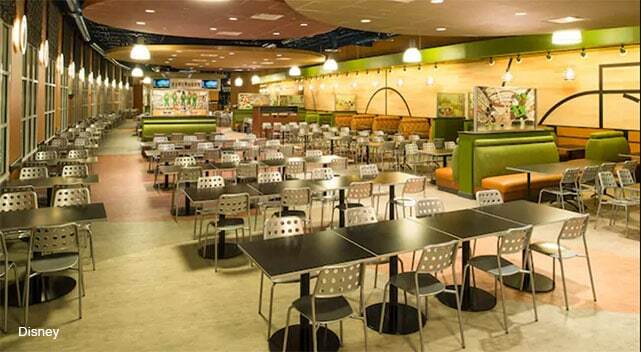 If you are looking for great dining options on a reasonable budget, you will love the End Zone Food Court. Located near the arcade and sundry store, End Zone offers three meals a day and snacks for hungry guests venturing back to the hotel between parks or pool time. The create your own pasta lunch option is my favorite meal at End Zone. During my stays at All Star Sports, I have often seen school and youth activity groups enjoying the resort together. One of the plus sides of this resort is that there are so many open spaces for larger groups to hang out and enjoy the company of each other without disturbing guests in nearby rooms. 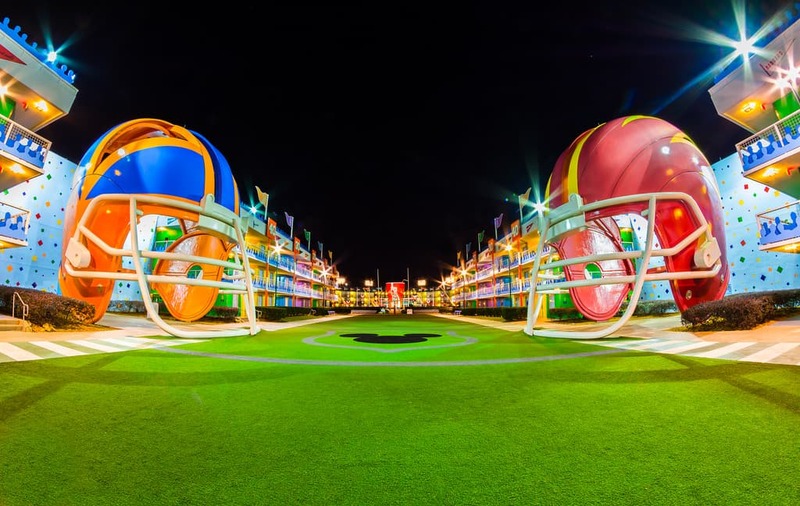 The Astroturf football field and outdoor seating near End Zone Food Court are great places to get away from the room and hang out with friends.